Like everything we build, wood trunks from Sawdust City are handmade in Eau Claire, Wisconsin. Our simple wood trunks offer fantastic form and function! These make great home décor while also making sure your storage furniture needs are met. 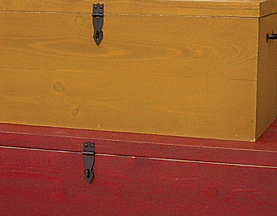 We have a set of small, medium, and large trunks that can be purchased individually, or together. Stack up all three in different colors at the end of a hall way or in a bedroom...they just look cool! Wel also offer a couple different storage chests and toy boxes. They are great wood trunks for blankets or toys, and look great in a cabin or cottage. The large wood trunk also makes a great wood box! Choose from our extensive color selection to match your decor.